Hotel knitting is a wonderous thing. No interruptions. Lots of time. It’s amazing the progress a girl can make. I finished the back of Ollie’s vest and started on the front. 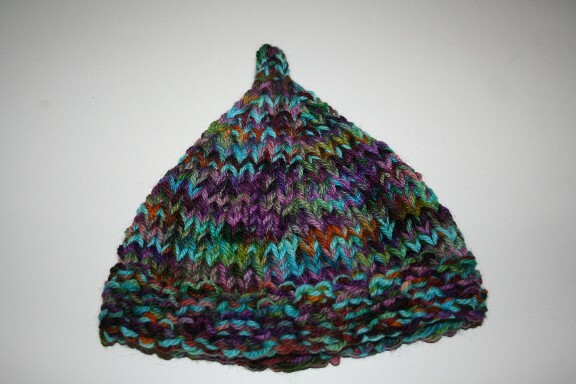 I modified the Meathead Hat pattern and made it for my niece for Christmas. 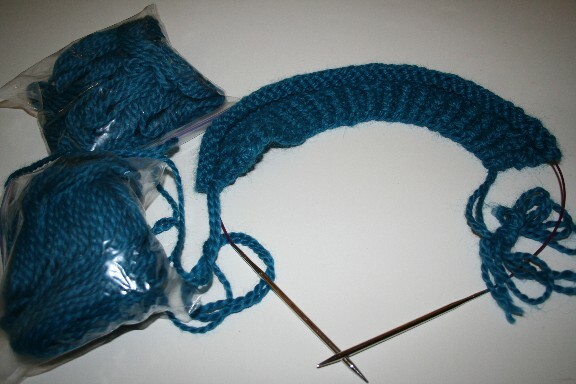 And fortunately, I had half a skein leftover, because Theresa Belville e-mailed me with a new hat pattern she had just written, to see if I had any yarn instock that would be right for making up kits (more on that later). I got all the way to the point where I had to switch to double pointed needles in the hotel room, and then brought it home to finish. 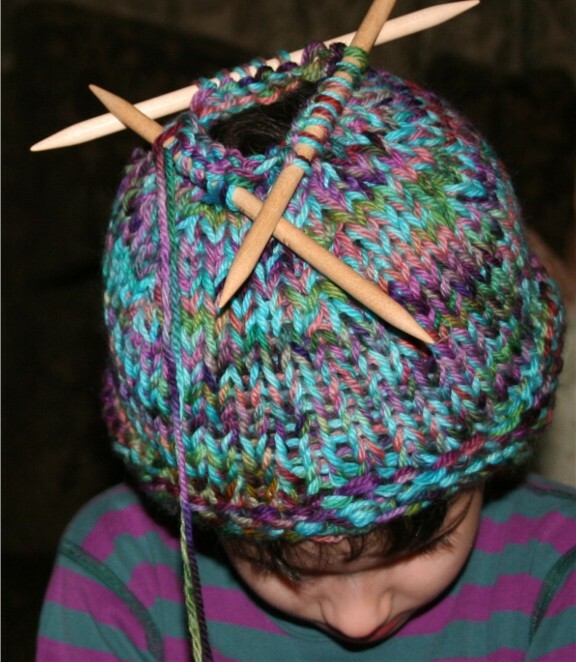 Sadly, my youngest has the much discussed "big Vance head" and the hat, which I knit in the toddler size is not large enough for him. Ellie does not have the big head, and was able to model the finished hat, although I’m afraid it’s fated for a smaller head. But there will be kits! I’m incredibly honored to collaborate with Theresa, and we’ll be listing them at the opening of our new online congo, Collage on Monday December 3 at noon. Collage includes not only Theresa and myself, but lots of wonderful artists and artisans, so make sure you take a look. Some of my favorite items at the grand opening are pictured below. Click on the thumbnails to see the actual items listings. If you haven’t finished holiday shopping yet and want to buy handmade, Collage has a great variety of unique, handcrafted items to choose from. I’ve also been restocking the Elliebelly website today. There are lots of new playsilks, including new sets of elemental silks. If you aren’t familiar with playsilks but are looking for children’s gifts and stocking stuffers, take a minute to look — they are one of my own children’s favorite all time toys. There are also lots of sale items throughout the site, including original artwork, nuno felted scarves,journals, and stitch markers for your knitting. And, of course, there is yarn. Lots of yarn, with more coming this week — cashmere, silk, blue faced leicester, bamboo, merino, mohair, cotton, and alpaca. Lots of yarn for gift giving, or for yourself, if you need a little break from holiday overload. I hope you’ll stop by Collage and Elliebelly and see what’s going on. This week I’ve got a little bit more hotel knitting time coming my way, and am hoping to finish up Ollie’s vest, as well as the Tillie Thomas baby cap I’m knitting, and which despite the pattern’s claim that it takes only one skein is clearly going to require me to go back and buy a second one. I hope you can find a little breath of peace before the onslaught of the holidays too and indulge your passion, whether it is knitting, art, or some other endeavor. Ellie may not get to keep the hat, but that photo of her in the hat is a keeper! She’s so beautiful — look at those cheekbones! Great job on the Heifer International fundraiser!